This list contains the most current and relevant directories for all brain and spinal cord injury doctors. Most people never think about the health of their brain or spinal cord until they suffer a catastrophic injury. But brain and spinal cord injuries are common. About 2.5 million people suffer traumatic brain injuries each year, according to the CDC. 450,000 Americans currently live with spinal cord injuries, with an additional 12,500 surviving these injuries each year. Your brain and spinal cord work together to form your central nervous system, which is akin to the body's control center. You might think of your brain as little more than the place where thoughts and feelings happen, but it regulates everything your body does, from digestion to procreation. The brain sends and receives signals through the spinal cord, so the two organs must be in optimal health for the body to properly function. A brain injury may impede your ability to send neurological signals, process those signals, or both. A spinal cord injury does not interfere with brain function, but does mean some or all brain signals might not make it to the intended target. Likewise, your body may struggle to send signals back to the brain. This is why so many people who survive spinal cord injuries lose sensation below the site of the injury. Brain and spinal cord injuries vary in severity, and the prognosis is hard to predict. Much remains to be understood about how these two important structures function and interact, so it should come as no surprise that some people spontaneously recover from their injuries. It's likely that these apparently miraculous recoveries are due to something we don't yet understand about the nervous system. More typically, recovery from brain and spinal cord injuries requires intensive and early treatment. Over time, your brain and spinal cord can learn how to work around your injuries, so don't lose hope. Treatment and rehabilitation really do work. Full or partial paralysis in any part of the body, particularly after an injury or accident. A sharp blow to the head, a car accident that resulting in head pain, or any fall that causes the victim to land on his or her head or neck. An open wound to the back or spine. A sharp blow to the spine or back due to a gun shot or other catastrophic injury. Confusion, changes in mood or personality, or loss of consciousness. Swelling on the head, particularly if the swelling is at the neck or on the back of the head. Memory loss, particularly loss of short-term memory. Sudden, new intense back or spinal cord pain. Loss of the ability to control your bladder or bowels, especially if this loss was preceded by an injury or accident. 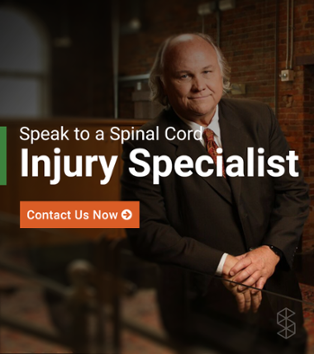 After a spinal cord or brain injury, it's obvious that you'll need neurological and orthopedic care. But these injuries can affect every system of your body, so it's not enough to seek care from a doctor who specializes solely in the brain or spinal cord. Quality care requires a team of experts to create a coordinated, specialized plan for your recovery. Every injury is different, and the severity of your injuries will change over time. Injury location also matters, since higher spinal cord injuries typically produce more physiological problems, just as more severe blows to the brain are more likely to impede a greater array of functions. Difficulties with sexual function, libido, or fertility. Changes in gynecological health, including disruptions to menstruation or hormonal imbalances. Changes in androgenic health, including disruptions in hormones production or function. Full or partial paralysis, numbness, or difficulty controlling limbs. Changes in cognition, memory, personality, or mood. Psychiatric problems. These can be due to an injury, such as when a blow to the brain impedes the brain's ability to process serotonin. Psychiatric problems may also result from the consequences of the injury. Many injured people struggle with depression, feelings of inadequacy, stress about finances, or anxiety about the future. This is a normal and expected part of the recovery journey that warrants proper medical treatment. Chronic pain that may be due to injured muscles, changes in pain perception, or phantom pain. No doctor can treat every symptom. Instead, your goal should be to find a primary care provider whom you trust to refer you to appropriate specialists. Don't shy away from asking lots of questions. Research consistently shows that people who question their doctors get better outcomes. Quality care matters, and it's worth your time and effort to find the best possible provider in each field. The following categories provide details about each specialty, a preliminary list of questions and considerations when choosing a specialist, and comprehensive directories. When possible, it's best to choose a specialist who is board-certified in his or her specialty. Note that not all specialties offer board certification. For instance, there's no such thing as a board-certified psychotherapist—just a licensed psychotherapist. Board-certified doctors are neurosurgeons who have met additional and voluntary training requirements. Board certification is a voluntary process, and some hospitals allow doctors to practice without board certification—especially if they are training under a board-certified specialist. Because board-certification verifies that your doctor has met a detailed list of educational and clinical requirements, board-certification offers more guarantees about your doctor's competence. In small cities and some rural areas, board-certified doctors may not be available, so remember that a doctor can be skilled at his or her specialty even without certification. Note that board-certification is a different process from licensure. Any provider who calls himself a doctor, as well as any provider licensed in another specialty, such as clinical social work, must meet stringent educational and clinical criteria. Board certification is merely an additional process that verifies your provider has undergone additional specialized training.